Frontotemporal dementia (FTD) is a clinically and pathologically heterogeneous group of non-Alzheimer dementias characterised collectively by relatively selective, progressive atrophy involving the frontal or temporal lobes, or both.1 2 3 4 Cases of FTD have been described since the late 19th century, initially most comprehensively by Arnold Pick, who lent his name to the historical designation of the entire FTD spectrum as Pick’s disease. Only in the past three decades, however, has the clinical and pathological complexity of these diseases and their unique status as examples of selective brain degeneration been fully appreciated. FTD is substantially less common than Alzheimer’s disease, with estimates of population prevalence ranging from four to 15 per 100 000 before age 65 years in European and US epidemiological studies.1 However, this disease group is of disproportionate importance as a cause of young onset dementia and all the attendant socioeconomic and human costs that entails. Although onset is typically in the sixth decade of life, it may begin as early as the third or as late as the ninth decade, and the prevalence of FTD in older age groups has almost certainly been underestimated. Here we provide a general overview of FTD, emphasising clinical aspects and highlighting recent progress and prospects. Figure 1⇓ provides a schematic overview of FTD showing major clinical and neuroanatomical syndromes and diseases, and the relations between them. We examined recent literature on frontotemporal dementia, targeting full text English language studies published since 1990. We selected articles on the basis of our personal knowledge and searches of the Medline database using the terms “frontotemporal dementia,” “frontotemporal lobar degeneration,” “progressive nonfluent aphasia,” “semantic dementia,” and “logopenic aphasia,” and each of these terms in conjunction with “diagnosis,” “treatment,” and “therapy.” The final selection of references was based on our judgment of relevance, completeness, and compatibility with recent clinical, pathological, and genetic criteria. What are the different syndromes of frontotemporal dementia? There are three main clinical syndromes of FTD, defined on the basis of leading features at presentation. About half of cases present with behavioural change (behavioural variant frontotemporal dementia), and the remainder present with language decline (primary progressive aphasia) characterised either by impaired speech production (progressive non-fluent aphasia) or by impaired word comprehension and semantic memory (that is, memory for meaning) (semantic dementia). There is variable overlap clinically between the syndromes and atypical parkinsonism and motor neurone disease. New consensus diagnostic criteria for FTD5 and the progressive aphasias6 have recently been formulated, but they are likely to be refined as more specific information about disease pathophysiology arises and neuroimaging and other techniques that can capture pathophysiological changes become available. We now discuss symptoms and clinical findings in the major syndromes of FTD. This syndrome is characterised by progressive decline in interpersonal and executive skills, with altered emotional responsivity and emergence of a variety of abnormal behaviours including apathy, disinhibition, obsessions, rituals, and stereotypies (see table 1⇑).5 Behavioural variant FTD can develop indolently, and early detection may depend on subtle changes of social circumstances (such as switching jobs or partners), idiosyncratic lapses of taste or social awareness, reduced libido, altered dietary or musical preferences, or more childlike amusements. The relevant history has to be actively sought by speaking with the caregiver alone; forgetfulness may be volunteered as the presenting complaint, even though careful questioning often suggests that the patient’s memory for everyday events is well maintained. To probe for a history of subtle behavioural change, we find it useful to ask the caregiver if the patient has said or done anything in public that has embarrassed other parties; if they seem less warm or affectionate (especially toward grandchildren or pets); if their food preferences have altered or narrowed or their table manners have declined; if they seem more concerned with timekeeping or tend to watch the clock; if there has been a change in their sense of humour; or if they have developed new hobbies or interests, especially with a religious or spiritual bent, and if these are pursued obsessively. During the consultation, patients’ spontaneous behaviours and interactions with others are often more revealing than formal neuropsychological testing: they may be impulsive or distractible, inert or impassive, disinhibited (picking up items unbidden from the examiner’s desk) or socially unaware (fixing the examiner with a baleful stare). Cognitive assessment may reveal deficits of executive functions requiring formulation of a strategy, response inhibition, or abstraction: widely used bedside executive tests include verbal fluency (list as many words as possible in one minute, according to a nominated criterion such as starting letter or semantic category), cognitive estimates (make an educated guess about some arbitrary property or quantity, for example, the number of lions in Belgium), and proverb interpretation (summarise the abstract meaning behind a familiar saying). Memory and posterior cortical functions are often relatively spared, and indeed performance on standard psychometric tests is sometimes remarkably preserved. There is often a paucity of associated neurological signs, though primitive reflexes (forced grasping or rooting) may emerge later in the course, and behavioural variant FTD may be associated with extrapyramidal or motor neurone signs as part of an overlap syndrome. Magnetic resonance imaging (MRI) findings in behavioural variant FTD are variable: there is often frontal and anterior temporal lobe atrophy (fig 1⇑), which tends to be asymmetric between hemispheres and to spare more posterior cortical areas, but the degree and extent of atrophy vary widely among individuals. Altered white matter signal may be prominent, usually in close proximity to areas of cortical atrophy, where it may reflect gliosis. Involvement of orbitofrontal cortex is an early harbinger of FTD8 but can be difficult to detect reliably, and brain atrophy may be detected only on serial studies. Metabolic brain imaging with single photon emission computed tomography (SPECT) or fluorodeoxyglucose positron emission tomography (FDG-PET) may be diagnostically useful in detecting regional dysfunction when structural imaging seems normal.9 Phenocopies of behavioural variant FTD with normal structural and metabolic brain imaging and lack of clear progression on serial neuropsychological assessment are increasingly recognised7: the nature of the underlying disease in these cases remains unclear. This is a highly characteristic syndrome led by progressive breakdown of semantic memory—the memory system that stores knowledge about objects and concepts based on the individual’s accumulated experience of the world. Typically, semantic dementia initially affects the highly elaborate brain knowledge system that mediates vocabulary—that is, knowledge of the meaning of words.10 Asking the meaning of familiar words, encountered, for example, in a menu (“What is asparagus?”), is pathognomonic of semantic dementia. 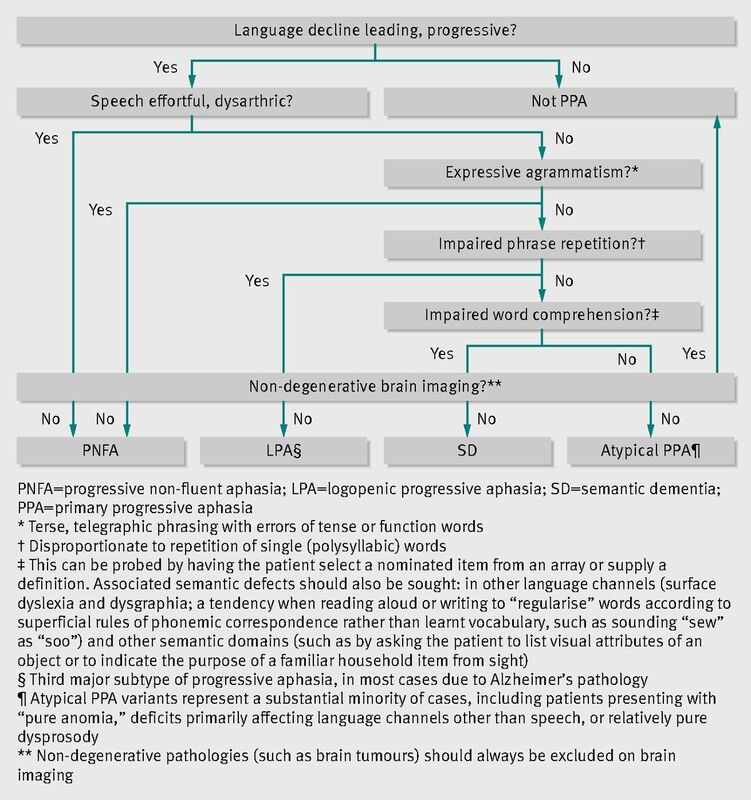 Patients commonly present with fluent (or even garrulous) but empty, circumlocutory speech with early prominent difficulty retrieving names, use of less precise terms, and impaired comprehension of word meanings, accounting for the “semantic variant of progressive aphasia” in the current classification (see fig 2⇑).6 Early in the course of the disease, the semantic deficit may be well compensated and may emerge only on testing more specialised knowledge previously at the patient’s command. A more pervasive semantic impairment also affecting visual information (impaired recognition of familiar faces (prosopagnosia) or of visual objects (visual agnosia)) and other non-verbal domains such as odours and flavours generally develops later in the disease course, as do behavioural disturbances broadly similar to those in behavioural variant FTD.10 The general neurological examination is usually normal. Semantic dementia shows a highly consistent and characteristic neuroanatomical (MRI) profile with selective, asymmetric anteroinferior temporal lobe cortical atrophy and hypometabolism (fig 1⇑),11 the gyral glia at the temporal poles often persisting only as a residual “knife blade” skeleton. Atrophy is predominantly left sided but may be right sided in cases led by non-verbal semantic deficits,12 with spread between the cerebral hemispheres and into more posterior temporal and inferior frontal cortices over time. This syndrome is led by a progressive breakdown in language output with effortful non-fluent speech. Several more or less distinct neurolinguistic syndromes are subsumed under the general category of progressive non-fluent aphasia.13 In some patients, speech sound (phonemic) or articulatory (phonetic, speech apraxic) errors are the dominant feature; whereas in others the syndrome is dominated by expressive agrammatism with terse telegraphic phrases (see fig 2⇑). These features commonly coexist as the disease evolves. Apraxia of other orofacial movements or swallowing often accompanies speech apraxia and is tested by asking the patient to yawn or cough, which they are unable to do to command, although they can as a reflex. Impaired sentence comprehension can generally be demonstrated on neuropsychological assessment, and literacy skills become affected in most cases. Progressive non-fluent aphasia may herald the onset of a neurological overlap syndrome with atypical parkinsonism or less commonly motor neurone features. Brain atrophy and hypometabolism in progressive non-fluent aphasia often affects perisylvian cortices in the dominant hemisphere mediating speech production (fig 1⇑).14 However, the profile of atrophy varies widely in extent and severity between patients. A third clinical syndrome of progressive aphasia, logopenic (Greek “few words”) aphasia, presents with hesitant but grammatically correct speech marred by word-finding pauses, anomia, and impaired phonological working memory manifesting as disproportionate difficulty repeating spoken phrases versus single words (fig 2⇑). Most cases will have underlying Alzheimer pathology,6 and more widespread cognitive deficits similar to those accompanying other Alzheimer phenotypes emerge later in the disease course. Brain MRI often shows predominantly left sided temporoparietal atrophy,14 though with substantial individual variation that overlaps with the neuroanatomical profile of progressive non-fluent aphasia. In the syndrome of FTD with motor neurone disease, behavioural or language dysfunction may evolve in tandem with motor neurone disease. However, all patients with FTD presentations should be assessed for the appearance of motor neurone signs (often initially deltoid or triceps fasciculations), while cognitive and behavioural involvement in patients presenting with motor neurone disease is almost certainly under-recognised. Neurophysiological studies may confirm widespread denervation, but for uncertain reasons this is often normal earlier in the course of FTD with motor neurone disease. As the genetic and pathological spectrum of FTD has become better defined, it has been recognised that molecular pathologies in this spectrum can alternatively present with clinical syndromes more typical of other neurodegenerative diseases, in particular Alzheimer’s disease. How is frontotemporal dementia distinguished from other diseases? 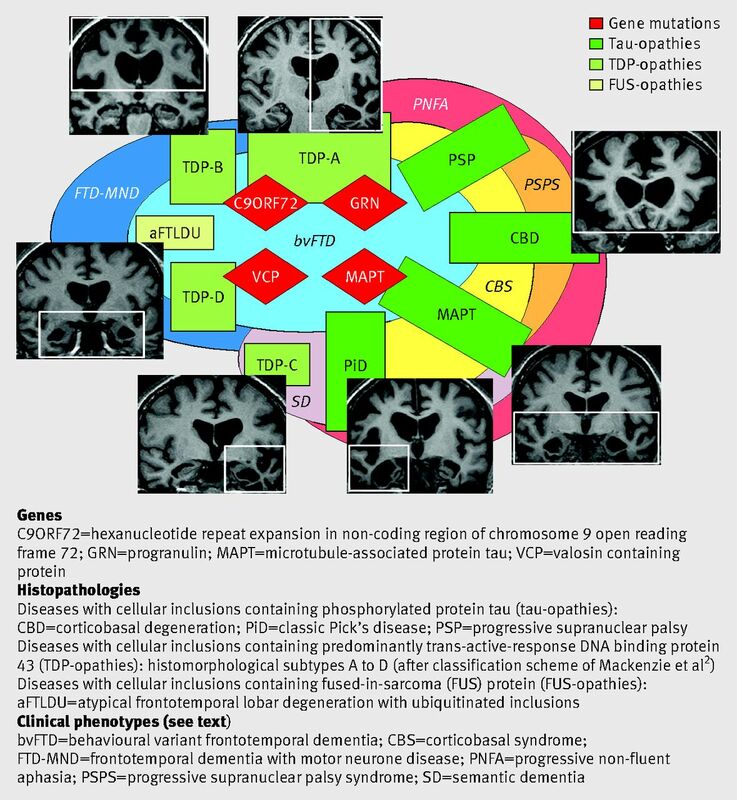 FTD syndromes must be distinguished from non-degenerative processes that present with prominent behavioural, executive, and language disturbance (such as primary psychiatric illness, tumours, and cerebrovascular disease) and from other neurodegenerative diseases (notably atypical variants of Alzheimer’s disease).6 Although cerebrovascular changes are common on brain MRI in older patients, primary progressive aphasia can usually be distinguished from vascular aphasic syndromes based on a history of insidious deterioration; the distinction between behavioural variant FTD and cerebrovascular behavioural syndromes is more challenging, but may rest on the relative extent of vascular and regional atrophic changes. Neuropsychological assessment is valuable in substantiating the bedside impression—particularly for detecting “subclinical” involvement of cognitive domains that help to define the phenotype, for quantifying impairment in domains that may be difficult to assess at the bedside (such as semantic memory or sentence comprehension), and for tracking deterioration over time. On MRI, lack of the focal brain atrophy profiles that characterise FTD or prominent white matter change are important clues to an alternative disease. Because of the wide phenotypic variation within the spectra of Alzheimer’s disease and FTD, it can be difficult to differentiate FTD from Alzheimer’s disease in an individual case based on clinical and imaging features.17 Clinical “red flags” that a patient has FTD rather than Alzheimer’s disease include early prominent behavioural features, especially if the social façade breaks down or insight is lost and if episodic and topographical memory remain relatively intact. Profiling of neurodegeneration marker proteins in cerebrospinal fluid is increasingly used in clinical diagnosis: a raised ratio of total tau protein to beta amyloid1 42 peptide sensitively predicts Alzheimer’s pathology,18 and incorporation of other amyloid and phosphorylated tau species may further enhance diagnosis.19 Cerebrospinal fluid profiling is likely in future to be supplemented by molecular neuroimaging (for example, for amyloid) and by more specialised structural MRI analysis tools. One large study found that cerebrospinal fluid profiling and analysis of brain MRI data with a specialised classifier algorithm could distinguish pathologically proven FTD from Alzheimer’s disease with around 75% accuracy.20 However, such techniques remain to be widely translated beyond specialist centres. The common pathological theme underpinning FTD is tissue deposition of abnormally aggregated proteins (see fig 1⇑).1 2 Three major pathogenic proteins have been implicated in FTD: cases with cellular inclusions containing predominantly phosphorylated tau or transactive response DNA-binding protein 43 (TDP-43) are approximately equally represented in autopsy series, while a substantial minority have inclusions containing fused in sarcoma (FUS) protein. These have been further classified into distinct subtypes, with only a dwindling minority of FTD cases having inclusions in which the pathogenic protein is unclear (see fig 1⇑). Can we predict molecular pathologies in frontotemporal dementia? What is the prognosis in frontotemporal dementia? What are the management options in frontotemporal dementia? There are no therapies currently shown to alter the evolution of any of the diseases in the FTD spectrum. Management is therefore directed to controlling symptoms and otherwise helping patients and their caregivers cope with the impact of their illness, including engagement of community mental health, social services, day centres, and other support networks. Patients and families need clear and specific advice as they face a future of increasing dependency, often including occupational and financial planning. This is particularly urgent where (as is often the case in FTD) patients lack insight into the true extent of their difficulties. Early, accurate diagnosis and mobilisation of appropriate support services at present offer the best prospect of effective management for patients with FTD. Non-pharmacological management strategies are based largely on anecdote and clinical experience rather than controlled evidence.24 Safety and risk management are important considerations that may entail environmental or other modifications affecting diverse aspects of the patient’s daily life: depending on the disease stage, these may include occupational and social activities, children or other vulnerable dependents, driving, swallowing, and mobility. Decisions about safety and competence may be particularly challenging earlier in the course of behavioural variant FTD, but the desire to preserve autonomy must be weighed against the potential for occupational, financial, social, or forensic hazards. Simple interventions (puzzles, music, and other structured activities, controlled access to food and drink) may help govern troublesome behaviours and contribute to a stable routine. Motor and gait symptoms should be anticipated as the disease evolves. Speech and language therapy can provide simple communication aids, as well as assessment of swallowing and advice on dietary modification, and mobility and continence aids often become necessary later in the course. Programmed respite, counselling, and psychological support for caregivers should not be overlooked: in contrast to other neurodegenerative diseases (notably Alzheimer’s disease), FTD tends to strike early at the core of personal identity, and the sense of living with a stranger is often a source of profound distress for families and caregivers. Genetic counselling of at-risk family members adds a further challenge and should always be undertaken in collaboration with a clinical genetics service. What are the future prospects for therapy? Translation of recent molecular progress into targeted therapies of the proteinopathies underpinning FTD seems likely to depend on earlier and more accurate disease detection and tracking as much as on animal and cellular models for drug development. More information is required about the clinical course of FTD syndromes, the early and presymptomatic manifestations of disease, and functional landmarks that subsequently affect patients’ daily lives. There is a particularly urgent need for new in vivo markers of specific pathological proteins (for example, tau binding ligands) and novel metrics of brain network disintegration and pathophysiology and complex behavioural symptoms in order to capitalise on recent insights from systems neuroscience. Collaboration among specialist centres, such as the Genetic Frontotemporal Dementia Initiative,31 with access to well characterised cohorts of patients with FTD will be essential to mount large scale trials of rationally targeted therapies that may finally allow us to treat these devastating diseases. Contributors: JDW and MNR had the idea for the article. JDW and JDR performed the literature review. All authors were involved in writing and critically revising the article. JDW and MNR jointly accept full responsibility for the work and controlled the decision to publish. Funding: This research was supported by the National Institute for Health Research (NIHR) Queen Square Dementia Biomedical Research Unit, the Medical Research Council, and the Wellcome Trust. The views expressed are those of the author(s) and not necessarily those of the NHS, the NIHR, or the Department of Health. Competing interests: We have read and understood the BMJ Group policy on declaration of interests and declare the following interests: financial support for the submitted work from Wellcome Trust and the Medical Research Council. JDW has received research grants from the Wellcome Trust, Medical Research Council, and Alzheimer’s Research UK. JDR has previously received research grants from the Wellcome Trust. MNR receives a consultancy fee as a member of the Safety Monitoring Committees for Janssen Al/Pfizer and Servier (paid into departmental funds not to MNR personally) and his department receives a grant from Pfizer for phase III imaging analysis; he is a director of the NIHR Dementia and Neurodegenerative Diseases Research Network, president of the Association of British Neurologists, a member of Neurology Scientific Advisory Group, EMA and Neurology and Psychiatry Group MHRA, and a vice president of the Alzheimer’s Society. Rabinovici GD, Miller BL. Frontotemporal lobar degeneration: epidemiology, pathophysiology, diagnosis and management. CNS Drugs2010;24:375-98. Mackenzie IR, Neumann M, Baborie A. A harmonized classification system for FTD-TDP pathology. Acta Neuropathol2011;122:111-3. Rohrer JD, Guerreiro R, Vandrovcova J, Uphill J, Reiman D, Beck J, et al. The heritability and genetics of frontotemporal lobar degeneration. Neurology2009;73:1451-6. Rohrer JD, Warren JD. Phenotypic signatures of genetic frontotemporal dementia. Curr Opin Neurol2011;24:542-9. Rascovsky K, Hodges JR, Knopman D, Mendez MF, Kramer JH, Neuhaus J, et al. Sensitivity of revised diagnostic criteria for the behavioural variant of frontotemporal dementia. Brain2011;134:2456-77. Gorno-Tempini ML, Hillis AE, Weintraub S, Kertesz A, Mendez M, Cappa SF, et al. Classification of primary progressive aphasia and its variants. Neurology2011;76:1006-14. Kipps CM, Hodges JR, Fryer TD, Nestor PJ. Combined magnetic resonance imaging and positron emission tomography brain imaging in behavioural variant frontotemporal degeneration: refining the clinical phenotype. Brain2009;132:2566-78. Perry RJ, Graham A, Williams G, Rosen H, Erzinçlioglu S, Weiner M, et al. Patterns of frontal lobe atrophy in frontotemporal dementia: a volumetric MRI study. Dement Geriatr Cogn Disord2006;22:278-87. Mendez MF, Shapira JS, McMurtray A, Licht E, Miller BL. Accuracy of the clinical evaluation for frontotemporal dementia. Arch Neurol2007;64:830-5. Hodges JR, Patterson K. Semantic dementia: a unique clinicopathological syndrome. Lancet Neurol2007;6:1004-14. Rohrer JD, Warren JD, Modat M, Ridgway GR, Douiri A, Rossor MN, et al. Patterns of cortical thinning in the language variants of frontotemporal lobar degeneration. Neurology2009;72:1562-9. Seeley WW, Bauer AM, Miller BL, Gorno-Tempini ML, Kramer JH, Weiner M, et al. The natural history of temporal variant frontotemporal dementia. Neurology2005;64:1384-90. Rohrer JD, Rossor MN, Warren JD. Syndromes of nonfluent primary progressive aphasia: a clinical and neurolinguistic analysis. Neurology2010;75:603-10. Rohrer JD, Ridgway GR, Crutch SJ, Hailstone J, Goll JC, Clarkson MJ, et al. Progressive logopenic/phonological aphasia: erosion of the language network. Neuroimage2010;49:984-93. Litvan I, Bhatia KP, Burn DJ, Goetz CG, Lang AE, McKeith I, et al. Movement Disorders Society Scientific Issues Committee. Movement Disorders Society Scientific Issues Committee report: SIC Task Force appraisal of clinical diagnostic criteria for Parkinsonian disorders. Mov Disord2003;18:467-86. Kertesz A, McMonagle P. Behavior and cognition in corticobasal degeneration and progressive supranuclear palsy. J Neurol Sci2010;15:138-43. Xiong L, Xuereb JH, Spillantini MG, Patterson K, Hodges JR, Nestor PJ. Clinical comparison of progressive aphasia associated with Alzheimer versus FTD-spectrum pathology. J Neurol Neurosurg Psychiatry2011;82:254-60. Bian H, Van Swieten JC, Leight S, Massimo L, Wood E, Forman M, et al. CSF biomarkers in frontotemporal lobar degeneration with known pathology. Neurology2008;70:1827-35. Verwey NA, Kester MI, van der Flier WM, Veerhuis R, Berkhof H, Twaalfhoven H, et al. Additional value of CSF amyloid beta 40 levels in the differentiation between FTD and control subjects. J Alzheimers Dis2010;20:445-52. McMillan CT, Avants B, Irwin DJ, Toledo JB, Wolk DA, Van Deerlin VM, et al. Can MRI screen for CSF biomarkers in neurodegenerative disease? Neurology2013;80:132-8. Rohrer JD, Lashley T, Schott JM, Warren JE, Mead S, Isaacs AM, et al. Clinical and neuroanatomical signatures of tissue pathology in frontotemporal lobar degeneration. Brain2011;134:2565-81. Brodaty H, Seeher K, Gibson L. Dementia time to death: a systematic literature review on survival time and years of life lost in people with dementia. Int Psychogeriatr2012;24:1034-45. Kertesz A, McMonagle P, Blair M, Davidson W, Munoz DG. The evolution and pathology of frontotemporal dementia. Brain2005;128:1996-2005. Seltman RE, Matthews BR. Frontotemporal lobar degeneration: epidemiology, pathology, diagnosis and management. CNS Drugs2012;26:841-70. Vercelletto M, Boutoleau-Bretonnière C, Volteau C, Puel M, Auriacombe S, Sarazin M, et al. Memantine in behavioral variant frontotemporal dementia: negative results. J Alzheimers Dis2011;23:749-59. Lebert F, Stekke W, Hasenbroekx C, Pasquier F. Frontotemporal dementia: a randomised, controlled trial with trazodone. Dement Geriatr Cogn Disord2004;17:355-9. Deakin JB, Rahman S, Nestor PJ, Hodges JR, Sahakian BJ. Paroxetine does not improve symptoms and impairs cognition in frontotemporal dementia: a double-blind randomized controlled trial. Psychopharmacol2004;172:400-8. Czarnecki K, Kumar N, Josephs KA. Parkinsonism and tardive antecollis in frontotemporal dementia—increased sensitivity to newer antipsychotics? Eur J Neurol2008;15:199-201. Jesso S, Morlog D, Ross S, Pell MD, Pasternak SH, Mitchell DG, et al. The effects of oxytocin on social cognition and behaviour in frontotemporal dementia. Brain2011;134:2493-501. Gass J, Prudencio M, Stetler C, Petrucelli L. Progranulin: an emerging target for FTLD therapies. Brain Res2012;1462:118-28. Rohrer JD, Frisoni GB, Galimberti D, Masellis M, Rowe JB, Borroni B, et al. GENFI—The GENetic Frontotemporal Dementia Initiative. Dement Geriatr Cogn Disord2012;34(suppl 1):1-289. Seeley WW, Crawford RK, Zhou J, Miller BL, Greicius MD. Neurodegenerative diseases target large-scale human brain networks. Neuron2009;62:42-52. Mahoney CJ, Malone IB, Ridgway GR, Buckley AH, Downey LE, Golden HL, et al. White matter tract signatures of the progressive aphasias. Neurobiol Aging2013, doi:10.1016/j.neurobiolaging.2012.12.002. [epub ahead of print]. Warren JD, Rohrer JD, Schott JM, Fox NC, Hardy J, Rossor MN. Molecular nexopathies: a new paradigm of neurodegenerative disease. Trends Neurosci (forthcoming).